There is a sense of serene peacefulness in many places in Laos: Luang Prabang, for example, and Pha That Luang in Vientiane. Indeed, it is easy for foreign visitors, meeting the smiling faces, to forget the traumas of a people who have suffered 300 years of bloody battles  many of the tragedies, like becoming the most bombed people in the world, well within living memory. Although lowland Laos has been settled for thousands of years, today's population began growing through refugees and migrants from the end of the first millennium. Historians think this time was probably relatively peaceful but by the end of the 17th century all that had changed. The kingdom was split in three by rival rulers and then the Burmese overran northern Laos, capturing and occupying Luang Prabang, and the Siamese captured Champasak in the south. The relentless Siamese pushed further into Laos, eventually conquering and largely depopulating centres as far apart as Vientiane  Wieng Chan in Lao rather than the violent transliteration of the French  and Luang Prabang before, in 1885, they settled down to protecting the areas east of Luang Prabang from Chinese Haw attacks. In the next few years, as the present-day Laos borders were agreed with the surrounding countries, the Siamese handed over the country to the French colonialists. And this began a long chain of bloody events that reverberate today. The French pulled together all the factions and territories within the Laotian borders and ruled them as one kingdom. And, in the way that Russia left a timebomb ticking when it suppressed and then freed the countries and ethnic groups of the former Yugoslavia, so the French welding of the Indian-influenced cultures in the west of the country with the Chinese/Vietnamese-influenced cultures in the east left a situation ticking towards what some historians now see as inevitable conflict. But before that episode erupted into the civil war of the 1970s, the country saw the build-up start with the Japanese marching in with the connivance of the French Vichy government  and without much Laotian resistance  during the Second World War. This armed occupation from 1941 until 1945 became  as in many colonised countries  a catalyst for independence. The Japanese had the French-backed King Sisavang Vong declare independence from the French towards the end of the war. But his reluctance to grab independence from the French, understandable since the French had supported and helped the royal family since taking the country as a colony in the dying days of the 19th century, sparked the first Laotian resistance movement. That resistance was brutally smashed after the Japanese left by royal supporters and French forces  and action that united many more rebels. In 1950, the first Lao resistance army was being formed in the impenetrable eastern part of the country and the first real links were being make with Vietnam's communist Viet Minh. Three years later, the French were glad to hand back troubled Laos to its people as it fought, without success, to check Viet Minh advances through its valuable Vietnamese colony  the opening stages of the catastrophic confrontation between the people of the region and the vastly powerful American forces during the Vietnam War. From 1964 until the end of the Vietnam War in 1973, there were two plots being played out in the Secret War in Laos. The overwhelmingly powerful story was the way that a tiny, undeveloped and poor country was caught in the tornado of other people's warfare. But the story on the ground, played out within the East-West conflict, was the growing struggle in Laos between the Chinese-backed communist forces of the Pathet Lao and the US-backed forces of the royal family. As the confrontation between North Vietnam and America intensified, the US operated its bombers from Thailand, flying over Laos to hit targets in Vietnam and looking for Pathet Lao bases to bomb in the east and north-east of Laos. During the mid-1960s, America dropped 200,000 gallons of Agent Orange along the Ho Chi Minh Trail, poisoning the forests along the border between Vietnam and Laos to hit North Vietnamese forces. The effect on Laotian civilians was devastating: they were poisoned, as were their animals, their crops and their drinking water. In 1970, the US turned up the heat with President Nixon authorising the American airforce's B-52 bombers to hit targets in Laos. To add to Laotian misery, B-52 captains had orders not to take any bombs back to their bases in Thailand. So they dumped them of Laos, bombing populated centres  mostly in eastern provinces. In the first six years of the conflict, nearly half a million tonnes of explosives were rained down on Laos. In the next three years, nearly that much was used against the Laotians every year: a staggering total of nearly two million tonnes by the time the peace agreement was signed in Vietnam. The ordnance-rich US dropped more explosives on tiny Laos than it dropped on all its Second World War targets put together: half a tonne of explosives for every man, woman and child in Laos, the equivalent of 10 tonnes for every square kilometre. This appalling disregard for civilians and the long-term consequences of a desperate campaign made the Laotians the most bombed people in the history of warfare  and the legacy of that and the era's land battles has been unexploded ordnance over most of the country. The air war was never enough. And nor was the protection of the 1962 Geneva convention that sought to guarantee the neutrality of Laos. 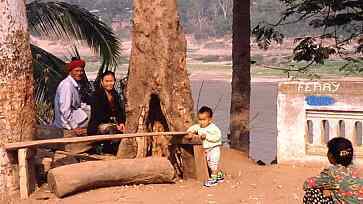 The subtext of the old conflicts  the Indianised Hmong hill tribes and royal forces on one side and the Sinocised and Vietnamese-influenced communists from the east on the other  were there to be played out. It was a dirty, secret war without mercy: complicated and deadly patterns of allegiances reaching out across the world as, on the jungle-clad ground, the dead piled up. The Americans  who first started training the Royal Lao army in 1959  learned from the French to use the Hmong: the CIA financed and ran a secret army of Hmong, Lao and Thai fighters. US military pilots flew missions from a network of landing sites inside Laos in old planes and civilian status: the Air America of Mel Gibson but with the risk of death being 1 in 2 over their tours of duty. By the early 1970s there were some 400 military airstrips, known as Lima sites: as many as 800 US volunteers may have died in the air and on the ground  the price the Hmongs paid is probably in the thousands. While the US had bases in western areas, the Vietnamese totally ignored the supposed neutrality of Laos and poured men and weapons into the eastern and northern areas, training and directly supporting the Pathet Lao fighters. The rules were simple: there were no rules. Death and destruction, in ground fighting and from the air, was unceasing until the communist forces prevailed over the royal Lao army, the Hmongs and their allies, and the Americans. By spring 1975, it was all over for US hopes. And Laos was a wreck of a country with vast areas saturated with mines, unexploded bombs, grenades, phosphorus bombs  almost anything that could be used to kill. The Lao elites, the defeated fighters and Hmong families began fleeing across the Mekong into Thailand  an exodus that grew as the triumphant communists began an era of repression and 're-education'. The US took most of the refugees but others passed through camps in Thailand and resettled worldwide. Others melted into the Thai population. France took in those of the royal family who managed to escape. They are still based there today and they still hope that, one day, they will be able to return. For those who remained in Laos, life was brutal under the Pathet Lao: killings, imprisonments and forced 're-education' spread terror and further reduced the population. Among the victims was the King, Queen and Crown Prince  they died after being arrested. This was the start of a period of self-imposed isolation for Laos that lasted until communism worldwide softened into accommodation with the commercial power of capitalist countries. By the late 1990s, Laos's communist government was welcoming foreign aid, trade and tourism. But even during that decade, Hmong guerrillas were still making much the country unsafe for the military and civilians. Gradually the Lao army and secret service got a grip, still slippery at times, and the country is slowly being opened up with new paved routes carrying commercial and tourist traffic. Poor relations with Thailand  including a fierce border war in the eighties  have been patched up and now the Thais are helping Laos get into the modern capitalist world; the special relationship with the Vietnamese has been continued; China is helping with road building; and the old enemy, Japan, is at the forefront of aid and commercial projects. Sporadic armed activity still shows the fault lines of the past 30 years. And, with the world happier to bomb and mine than clean up, scores of people, many of them children, are still killed every years by the debris of war.